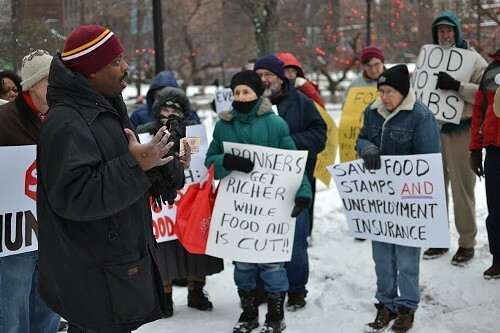 Al Porter, a leader with Black on Black Crime Inc., speaks about his experiences with food stamps. 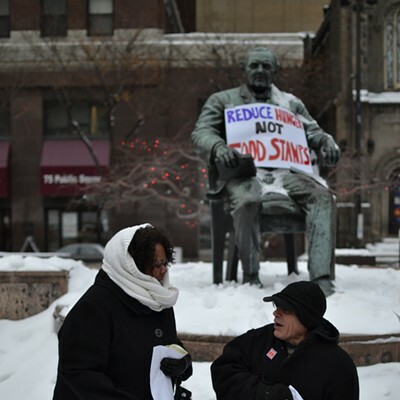 Tom Johnson, former mayor of Cleveland, looked upon the freezing congregation. His steely gaze was sympathetic, as theirs was a cause he surely would have lent support during his administration (1901 to 1909). 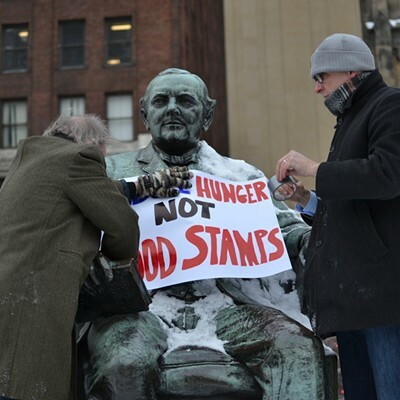 But Johnson is now simply a statue located on the northwest quadrant of Public Square, where dozens of Cuyahoga County residents gathered yesterday to protest the state's impending cuts and alterations to the food stamps program. 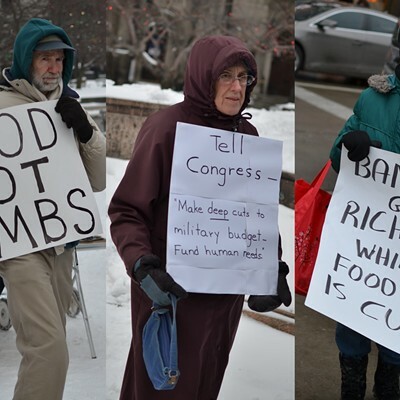 The group was meeting Dec. 17 to openly protest the cuts in SNAP funding being leveled by the federal government and the refusal to continue to waive work requirements for the program here in Ohio. Gov. 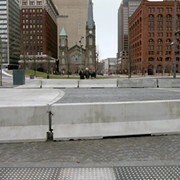 John Kasich announced the end of that ongoing waiver back in September. 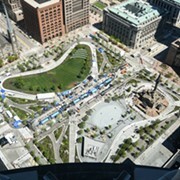 Since then, Cuyahoga County leaders have been scrambling to figure out to how approach the new system. To begin, the county will spend about $800,000 on overtime pay for employees to make phone calls to SNAP-eligible individuals. Estimates range from 29,000 to 33,000 people in the county who are eligible for the program, some of whom will apply and attempt to pick up the necessary work requirements, and some of whom will opt out of the program. 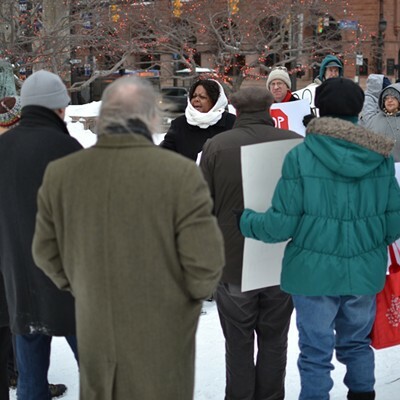 The economic downturn that began in 2007 and the resulting cloudburst in late 2008 urged Ohio's government to waive work requirements - working 20 hours each week or attending work training. Kasich opted to shut down that waiver this year. That action came just around the same time that federal funding boosts to SNAP expired (on Nov. 1). Benefits shrunk to an average of $1.40 per person per meal. 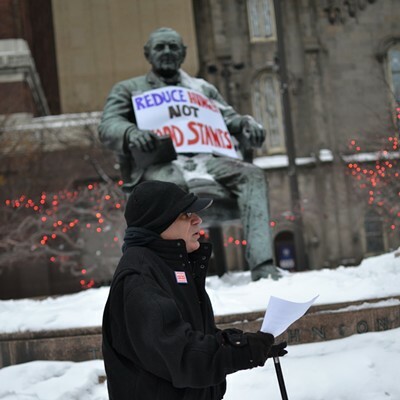 Diana King was one of several SNAP-eligible residents who spoke at the rally about the impact of the cuts. 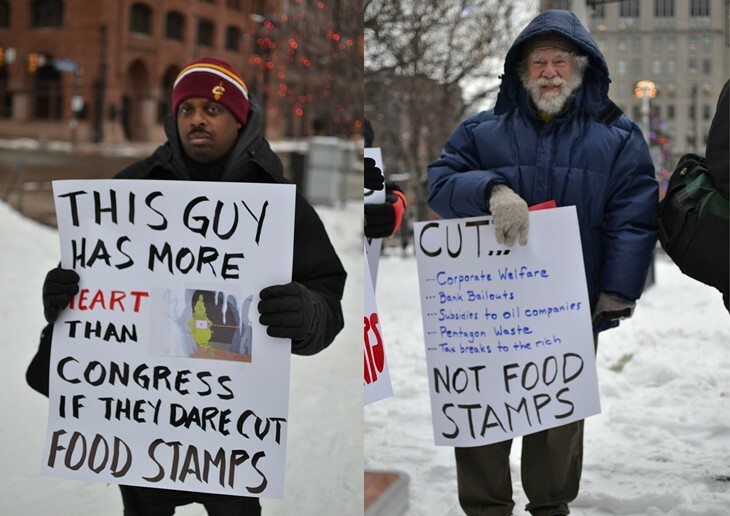 She told the crowd that the cuts push already-slim SNAP benefits to brutal levels. King received $154 in October for her family of five. That was cut to $113 in November. 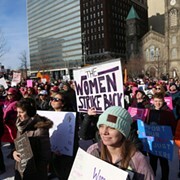 "This is about economics," Pam Rosado, outreach coordinator for Policy Matters Ohio, said. 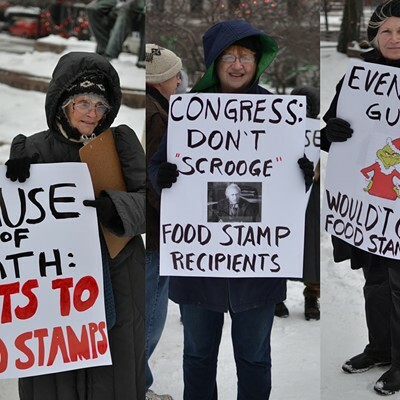 "Those food stamps help boost our economy. 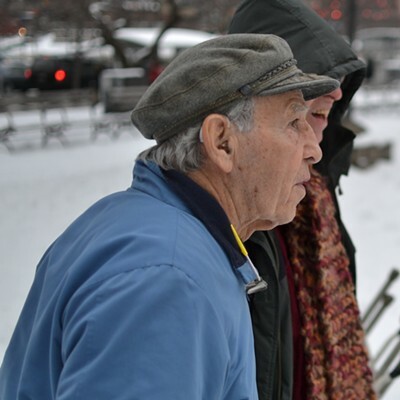 We're talking about a loss of about $15 million to our community...We're talking about millions of dollars that would be spent in this community and spent on a basic need - a basic need of life." And the renewed work requirements put SNAP behind another layer of governmental pressure. Rosado added that the state presently has 10,000 work slots that comply with SNAP requirements. 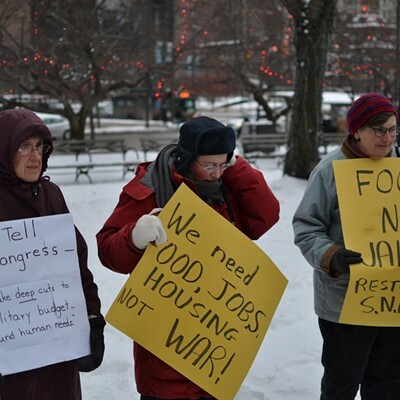 But there are an estimated 134,000 people in need of those jobs in Ohio. "That's math that you can't even do!" she exclaimed. Cuyahoga County Executive Ed FitzGerald, who said he would take the "food stamp challenge" and live off $4.18 each day for a week in November, has hammered Kasich on this matter. In County Council meetings, his input from the side of the room often sounded more like political football commentary, but his points remained valid as government leadership debated just how in the hell they were going to comply. 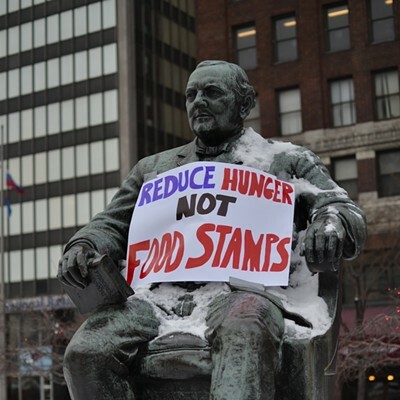 "The war on the poor is not rhetorical," he said at a November County Council meeting. "It's substantive, and this is a substantive policy that's going to be imposed on thousands of people in this county."